But it didn’t lead to productiveness in either of the areas I normally write here about. 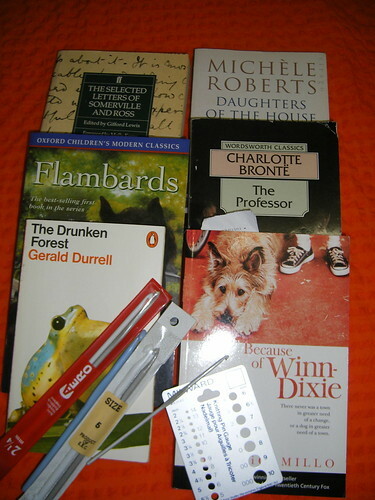 A good haul from the Oxfam shop on the way home, but I should have been quicker, as Shabbos is in less than an hour. The books are for me (and yes, I started one on the walk back with all the shopping – got to chapter seven), and the hooks are for teaching the kids at work to crochet. I spent an hour teaching one today, and I think she’s borrowed my favourite hook (which thankfully isn’t mid-project just now) but I wanted some that were cheap enough to give away. Now I just need yarn for them. I didn’t really get any reading done at work today, though, so no new books for the list.